Study examines how regular updates about berth availability prior to arrival can save fuel, lower emissions. 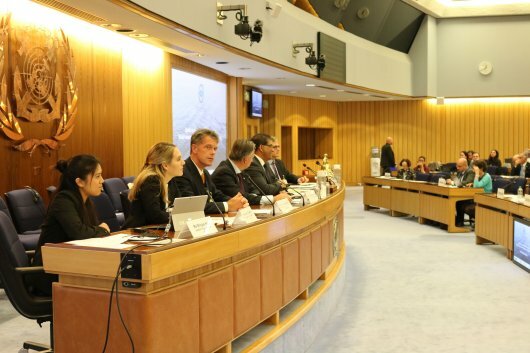 The results of a study that looks into bunker savings and the reduction of emissions with 'just-in-time' (JIT) sailing have been presented this week during the fourth meeting of the IMO's Intersessional Working Group on Reduction of GHG Emissions from Ships (ISWG-GHG 4). The study, which was commissioned by Port of Rotterdam Authority and research institute TNO, concludes that if seagoing ships were kept informed more regularly - particularly during the last twelve hours before arrival - about exactly when their berth will become available, they would be able to adapt their sailing speed accordingly and substantial savings could be made in terms of fuel and CO2 emissions. The idea is that by ships reducing their speed so that they arrive just in time, it leads to less fuel consumption and therefore lower emissions. Significant savings are also possible thanks to shorter waiting times for ships in anchorage areas, Rotterdam's port authority notes. "In percentage terms, we're talking about modest amounts," said Astrid Dispert, Technical Adviser of the Global Maritime Energy Efficiency Partnerships (GloMEEP) Project. "But it's exactly these types of measures that can make a huge difference in the short term and help reduce the carbon footprint of marine shipping. Added to that, they'd also have a beneficial effect on the wallets of the shipping companies." The study analysed all the movements of container vessels sailing to Rotterdam in 2017. And according to Jan Hulskotte, Senior Researcher at TNO, four percent - or 134,000 tonnes - of CO2 emissions could be saved per year if boxships adjusted their sailing speed by an average of five percent, whilst still arriving at the planned arrival time. Even more savings could be made if vessels were better informed more than 12 hours before arrival, the study says. The researchers examined the impact of shorter waiting times in anchorage areas for all ships sailing to Rotterdam. In the bulk transport sector, ships sometimes have to wait at anchor for hours or even days; this is mainly due to contractual obligations. Hulskotte said: "If this waiting time was an average of 12 hours shorter, that would really make a difference in percentage terms, with an annual reduction of 35 percent in emissions. So we're talking about 188,000 tonnes of CO2 and 1,000 tonnes of nitrous oxides." Earlier this year, Port of Rotterdam Authority launched its 'Pronto' port call optimisation platform, which combines a variety of data sources so that a port call by a vessel can be planned as accurately as possible and activities that must take place during the port call can be seamlessly coordinated with each other. Data from the JIT study has been converted into a view in Pronto in a move designed to make JIT sailing possible. This way, shipping companies can see what the sailing speed was, what the ideal speed would have been and how much fuel and CO2 could have been saved. "It's a great idea, and we hope that other ports will also start doing it," remarked Allard Castelein, CEO of Port of Rotterdam Authority. "Only by working together intensively and taking action, we can reduce CO2 emissions." Discussing CO2-free operation - a topic that is being addressed at ISWG-GHG 4 and is due to be tackled again next week at the 73rd Marine Environment Protection Committee (MEPC) meeting - and how this ties in with the latest study, Castelein said: "Last year we asked the Wuppertal Institute to look into how the transport and logistical sectors could operate virtually CO2 emission-free by 2050. They said that our first step should be to take efficiency measures. This study shows that those measures are within reach." A short video explaining the concept of JIT arrival, developed by the GloMEEP Global Industry Alliance (GIA), was shown at IMO's headquarters during a presentation to delegates on the sidelines of ISWG-GHG 4. It can be viewed by clicking here.